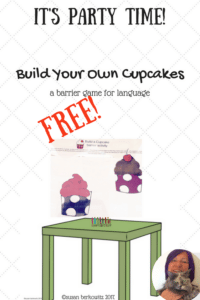 Over the course of my speech-language therapy career I have used barrier games a lot. I came across my first intervention guide to using barrier games a few decades ago, which contained geometric shapes of different sizes and colors. That quickly became boring. Part of the problem was that the intent of barrier games is two-fold: on one side of the barrier a student needs to learn to listen carefully to the descriptions and directions, process what he’s heard, and follow the directions to create a scene identical to the one the speaker is describing. On the other side of the screen, the student needs to provide concise descriptions and directions using robust vocabulary so that the listener understands what he is to do to create the scene. The vocabulary of colors, shapes, and sizes was finite. There needed to be more variety and richness to the activity. I added rubber stamps and stickers to my intervention bag. Rubber stamps were fun and could be used over and over again; unlike the stickers, which had a single use only. I started using Clingforms and Unisets – those plastic pictures that could be moved and repositioned. I had sets that represented grocery stores, zoos and aquariums, a family home, and more. Barrier games can be fun in pairs, small groups, or even whole classes. 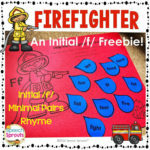 They have been used for decades as a fun way to build both listening and speaking skills. Having a pair of students take turns giving and following directions develops concise directing and describing skills in a fun activity. 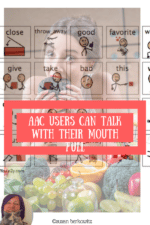 Students learn to listen carefully, and the therapist/teacher is able to focus on scaffolding and teaching such skills as chunking and re-auditorization without having to simultaneously be giving the auditory input. This particular activity can be kept simple for younger students, by having them simply take turns building and describing single cupcakes to each other. 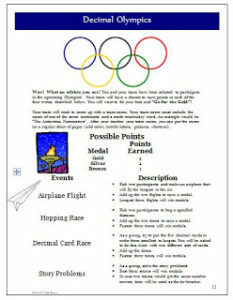 Or make it more fun for older or more competent communicators by using the scenes provided. Now I create my own barrier games. I still love the way that students get loads of real practice with giving and following directions, using and understanding descriptive vocabulary, and processing multiple critical elements. Here is a free barrier game set for you to use. If you haven’t tried them before, I think you’ll like both the way they work on skills, and the way your students have fun.